JPOST – Following the destruction of another cross-border terrorist tunnel from Gaza, Coordinator of Government Activities in the Territories (COGAT) Maj.-Gen. Yoav Mordechai has praised the technology behind its discovery. “I want to send a message to anyone who digs and approaches the tunnels: As you have seen in the past two months, there is only death in these tunnels,” Mordechai said. “Instead of investing millions in the fields of education and medicine, they buried it underground and now all of it has disappeared into oblivion. “This is a blatant violation of Israeli sovereignty, endangering the citizens of Israel and sabotaging the humanitarian efforts that Israel is making for the citizens of Gaza,” read a statement by the IDF. An air strike by the Israel Air Force late Saturday night in the southern part of Rafah in the Hamas-run Gaza Strip destroyed a 180-meter-long terrorist tunnel which stretched into both Israel and Egypt, the IDF Spokesperson confirmed on Sunday morning. Last week we were cheering on the State Department, that bastion of anti-Israel attitudes in every American administration, for telling the PLO that their mission was to be closed due to their non-engagement in the “peace process” and for their threats to bring Israeli officials before the International Criminial Corut. in response to Tillerson’s notification, the PLO lashed out as the US. Abbas and his advisers launched an all-out assault against President Donald Trump and his team of Middle East envoys led by his son-in-law and senior adviser Jared Kushner and his senior negotiator Jason Greenblatt. PLO-controlled media outlets published a flood of stories which trafficked in antisemitic conspiracy theories against Trump and his Jewish American advisors. The PLO media renewed its allegations that Kushner, Greenblatt and US Ambassador David Friedman are more loyal to Israel than to the US. Abbas’s media outlets also escalated their criticism of Saudi Arabia, Egypt and the UAE for their focus on combating Iranian aggression. These regimes are selling the Palestinians down the river, the PLO outlets have proclaimed, as Abbas’s flacks have insisted that the PLO will not accept any regional peace. Relations between Arab states and Israel, the PLO insists, cannot be fostered so long as Israel fails to capitulate to all of the PLO’s demands. In commentary published at the Gatestone Institute website, Palestinian commentator Bassam Tawil alleges that the Palestinian rejection of the requirements of US law and its assaults against the Trump administration and Sunni Arab states may serve as a pretext for another Palestinian terror campaign against Israel, which will be justified as a response to an American-Israeli-Saudi-Egyptian plot against the Palestinians. Given that the US is a superpower and the largest state financier of the PA, not to mention the foundation of the PLO’s claim to legitimacy on the world stage, the US might have been expected to respond harshly to the PLO’s threats and slanders. But then, that isn’t the State Department’s way of doing things with the PLO. Saturday, The Hill online newspaper reported that the State Department had changed its mind. It is no longer interested in following the law. Instead, it has rewritten the law. Now, it’s fine for the PLO to operate in Washington while trampling US law. It just needs to pretend it isn’t doing what it is doing. And if they aren’t, well, under this new interpretation of the law, the State Department can pretend it hasn’t noticed. By empowering the PLO to continue to breach US law – with the full expectation of continuing to receive US assistance to the tune of more than $500 million a year – the US has made itself a laughingstock. Neither Hamas nor the PLO will take the US seriously. Any pressure the US attempts to apply toward the PLO to moderate its stand toward Israel will be ignored by Abbas and his cronies in the PLO and Hamas alike. The Palestinians have taken the Trump administration’s measure. By beating a hasty retreat from its initial decision to stand with the law against the PLO, the State Department has told the PLO that the Trump administration is a paper tiger, at best. The Trump administration will do nothing against them. Instead, in the face of this contemptuous slap in the face to the US, Vice President Mike Pence will travel to Ramallah next month and have his picture taken with Abbas the “moderate” leader and peace partner. This then brings us to the second question of how surrendering to PLO threats will influence the US’s regional position. As Tawil reported, Al Quds, a Palestinian paper that reflects the views of Abbas and his associates, blasted the Arab League for focusing on Iran at its most recent foreign ministers’ meeting in Cairo. For more than a generation, the State Department, and through it US Middle East policy as a whole, have been captivated by the myth that nothing can happen in the Middle East without Israel first capitulating to PLO demands. By reversing course on closing the PLO mission, and groveling to the threatening PLO, the State Department made a laughingstock of the US and President Trump. The decision to reverse course should itself be reversed, in accordance with US law and in the interest in restoring what it is still possible to restore of US credibility in the Middle East. Will President Donald Trump fulfill his campaign promise of moving the US embassy in Israel from Tel Aviv to Jerusalem, as recent reports citing unnamed administration officials claim? Or will the president settle with a symbolic move of recognizing Jerusalem as Israel’s capital, as other senior sources have claimed? Last week, a number of unnamed senior US and Israeli officials were cited in reports claiming that the Trump administration is planning on finally implementing 1995 law requiring the executive branch to relocate the US embassy from Tel Aviv to Jerusalem, and to recognize Jerusalem as Israel’s undivided capital. Other reports claimed that the White House was not planning an embassy move in the near future, but was poised to declare that it recognized Jerusalem as Israel’s capital. While White House officials publicly refused to verify the claims, officials in Jerusalem have noted the timing of Vice President Mike Pence’s comments at the 70th anniversary of the United States General Assembly vote on Resolution 181, endorsing the establishment of a Jewish state. 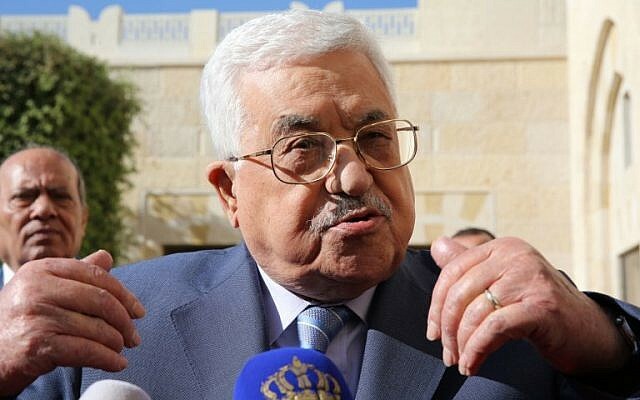 Abbas “warned categorically that taking such a step would lead to the destruction of the peace process and would bring the region into an uncontrollable situation,” according to his spokesperson Nabil Abu Rudeineh. On Wednesday Abbas ordered his foreign minister to demand the Arab League and the Organization of Islamic Cooperation hold emergency sessions regarding the possible US measures. On Friday, a delegation from the Palestinian Authority reportedly met with presidential adviser Jared Kushner to warn that if the White House announces the relocation of the US Embassy from Tel Aviv to Jerusalem, or if Trump makes remarks acknowledging Jerusalem as Israel’s capital, this would mark the end of the peace process, according to Israeli news reports. Any such steps “will kill the negotiations,” the PA delegation — which included Majed Faraj and Saeb Erekat, senior officials close to Abbas — told Kushner, Hadashot news reported. Hamas is still determined to remain relevant (even while begging Fatah to take over the running of the Gaza strip), and has threatened another intifada if the US recognizes Jerusalem as Israel’s capital. Five months ago, 28 year old Ziv Moyal, an Israeli security officer at Israel’s embassy in Amman, was stabbed in his apartment by a Jordanian assailant, whom he shot and killed. Moyal also accidentally killed his Jordanian landlord, who was present on the scene. 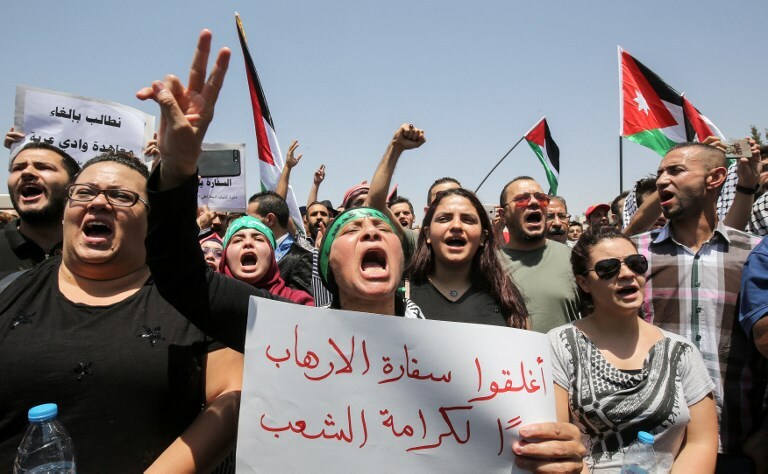 In the immediate aftermath of the incident, incited by the state-controlled media, the Jordanian public was whipped into an anti-Israel frenzy. In short order, a mob surrounded the embassy, to which Moyal and another 20 Israeli diplomats fled immediately after the shooting. For 24 hours, those Israeli diplomats, led by Ambassador Einat Schlein were besieged. Despite the fact that they are barred from doing so under the Vienna Convention, Jordanian authorities demanded to interrogate Moyal. By refusing to enable the diplomats to safely return to Israel until Moyal submitted to questioning, they effectively held Schlein and her colleagues hostage. But Jordan isn’t interested in ending the crisis it deliberately precipitated. So, unless Israel criminally prosecutes its diplomat who was attacked in his home by a terrorist, Jordan will continue to breach its peace treaty with Israel and bar the Israeli embassy from operating in Amman. According to the Jordanian media – which he controls – Abdullah is devoting significant time in his meetings with senior administration and Congressional officials to attacking Israel. Specifically, Abdullah is lobbying against President Donald Trump’s intention to move the US embassy to Jerusalem, in accordance with US law. During his visit, Abdullah also met with Pence, Secretary of State Rex Tillerson and Trump’s national security adviser, H.R. McMaster. 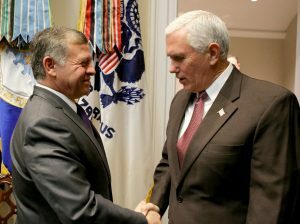 Although Jordanian media reports of those visits did not include information regarding the possible move of the US embassy, it stands to reason that Abdullah made similar points to Pence, Tillerson and McMaster. It can only be hoped that Abdullah’s warnings were rebuked by his American interlocutors. Because, if terrorists are motivated to act in the wake of a US decision to move the embassy, Jordan will hold a significant share of the blame. Last March, for instance, Abdullah rejected the US’s extradition request for Hamas terrorist and mass murderer Ahlam Tamimi, the mastermind of the 2001 Sbarro bombing in Jerusalem. Fifteen people, including eight children were murdered in the attack. Tamimi selected the Sbarro pizzeria as her target because of the large number of children who frequented the eatery during summer vacation. She was sentenced to 16 life-in-prison sentences, but was released in Israel’s exchange of Hamas terrorists for captive IDF sergeant Gilad Schalit in 2011. Upon her release, she moved to Amman where Abdullah gave her the red carpet treatment. 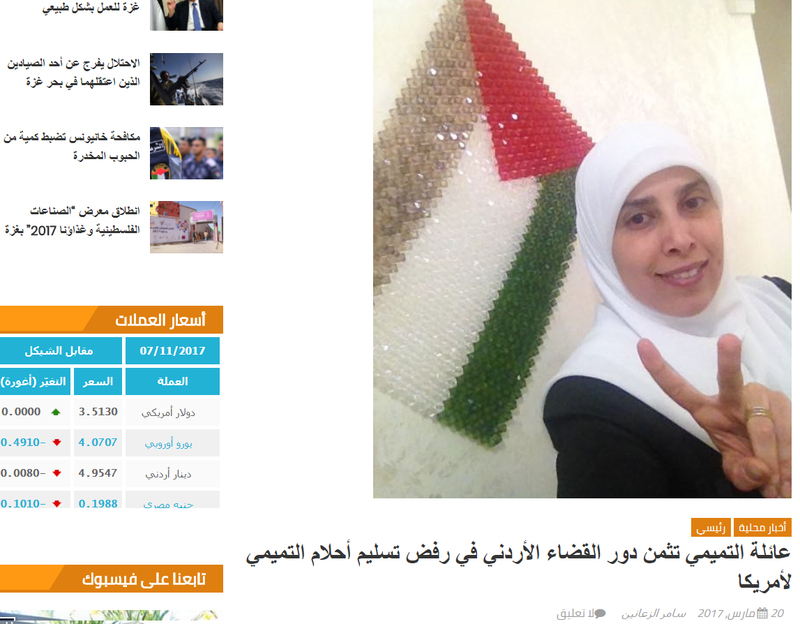 In her new home, Tamimi hosts a show on Hamas’s television station. She uses her platform to incite terrorism and indoctrinate her viewers to aspire to murder Israelis, as she did. 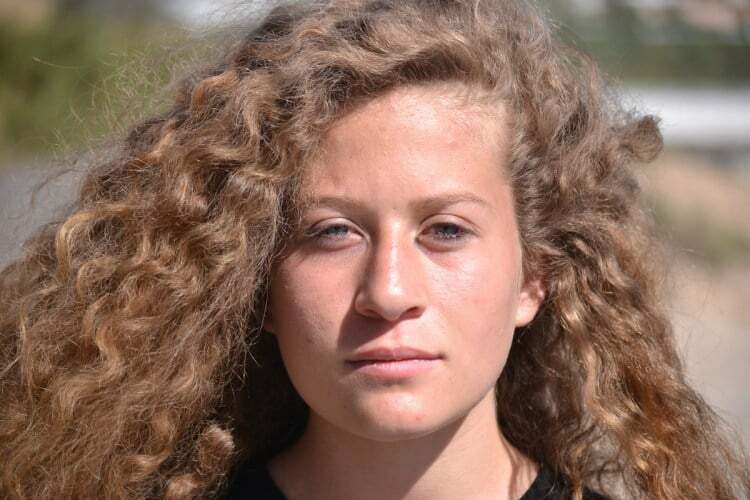 Several of Tamimi’s victims at Sbarro were American citizens, including 15-year-old Malki Roth and 31-year-old Shoshana Judy Greenbaum. Greenbaum was five months pregnant when her body was blown apart. By harboring Tamimi, Abdullah tells his subjects they are right to hate Israelis and to work toward Israel’s destruction. Arnold and Frimet Roth, the parents of Malki Roth who was murdered in that terror attack, have been relentless in following Tamimi’s doings and pulling every string, contact every diplomat and politician possible, in order to have her extradited – all to no avail so far. You can follow their endeavors at their blog This Ongoing War. This brings us to the question of Trump’s possible decision to move the US embassy in Israel to Israel’s capital. By having his media spew a constant diet of genocidal antisemitism, Abdullah is all but guaranteeing that the terrorism he warns of will occur if Trump enforces US law and moves the embassy. So he is not speaking as a worried friend when he tells his American hosts of the dire consequences of moving the embassy. He is threatening them with an outcome for which he will have significant responsibility. One of the reasons Abdullah feels comfortable making the argument that moving the embassy will provoke terrorism is because that is the argument that has been used successfully to block the transfer of the US embassy to Israel in the past. But, in October, we received a clear indication that these Chicken Little warnings are untrue. 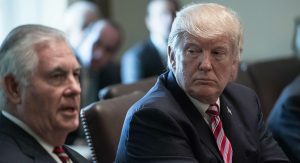 In October, Trump overruled Secretary of Defense James Mattis, Tillerson and McMaster, and chose not to tell Congress that Iran was in compliance of the nuclear deal the Iranians were breaching. Supporters of the nuclear deal in the administration and outside of it warned that such a move would have a deeply destabilizing impact on the region and endanger the US. As the past three months have shown, those warnings were entirely wrong. The world did not explode after Trump rejected the received wisdom of the foreign policy establishment in Washington. Instead, the US’s Sunni-Arab allies have been empowered to join forces to combat Iran. Economically and diplomatically, Iran is far more isolated globally today than it was three months ago. … if Trump disregards Abdullah’s threats posing as warnings, and disregards the advice of Abdullah’s many friends in Washington, and moves the US embassy to Jerusalem, the sky will not fall. By recognizing the basic fact that Jerusalem is and always will be Israel’s capital, Trump will give himself the ability to develop Middle East policies that are similarly grounded in reality. Unfortunately, the State Department did not follow through on Trump’s new strategy. They blinked in the face of Palestinian threats of violence, and retracted their threat to close down the PLO offices. Will they blink again when it comes to moving the US Embassy to Jerusalem? I fear they will but am prepared to be pleasantly surprised. The Custodian of the Two Holy Mosques, King Salman of Saudi Arabia personally intervened in the Temple Mount crisis via the United States, according to a report posted Tuesday by the Arabic-language Elaph website, based in London. The decision by Prime Minister Benjamin Netanyahu and top Israeli security officials late Saturday night to reopen the holy site to Muslim worshipers, visitors and tourists allegedly came after receiving a message from the Saudi monarch via the White House. Moreover, the Saudi king expressed no reservations about Israel’s decision to upgrade security by installing metal detectors at the entrances to Jerusalem’s Temple Mount in the wake of the terror attack last Friday that left two Israeli policemen dead and others wounded. “The issue of metal detection machines, said the source, is a matter that has become routine in the holy places because of terrorism, which strikes without discrimination and in most places regardless of the sanctity of the different religions,” reported Elaph. The Grand Mufti of Jerusalem, Muhammad Hussein, warned followers that their prayers would not be accepted in Heaven if they pass through the metal detectors to enter the Temple Mount for prayers in Al Aqsa Mosque — the third holiest site in Islam. Given that King Salman is the Custodian of the Two Mosques, Islam’s two holiest sites, one might consider his authority to overrule that of the Mufti in spiritual matters such as effect of metal detectors on the human body and its ability to convey prayer to heaven. (Ayala Shapira is a young teenager (and one of my granddaughter’s best friends) who, two and a half years ago, at age 11, was horrifically injured in a firebomb attack by a Palestinian terrorist. 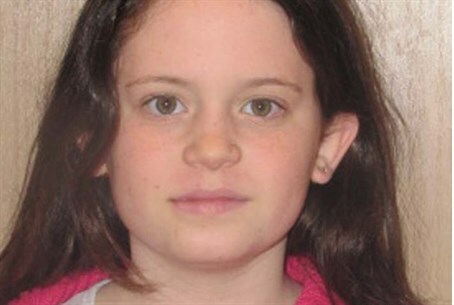 You may remember that Ayala Shapira was the 11-year old girl who was terribly injured in December 2014 by a Molotov cocktail (i.e a firebomb) thrown by a Palestinian terrorist at the family car. She suffered horrific burns to her face and upper body, and was more dead than alive for a while. She has made a miraculous recovery but still suffers from the burns, has endured many operations and skin grafts, and will have to undergo still many more until she is completely rehabilitated. She has to wear a pressure mask for much of the time as well. Ayala has shown remarkable courage and stoicism in coping with the terrible pain and disfigurement, as well as her missing schoolwork and social life. Her friends (I’m proud to say my own granddaughter is one of her best friends) and her parents’ friends, family and community have been fantastic in helping out, whether practically or giving moral support, and of course the State has given the support that it gives to all victims of terrorism in Israel. Yet none of this compensates for the damage done. Ayala recently addressed the EU, recounting the attack and the story of her not-yet-finished recovery, stressing that she is determined to continue her life as normally as possible. The terrorists were arrested shortly after the attack, and this week the adult terrorist (the second was a minor) Muhammad Badwan, was sentenced in court to 18 years in prison and fined NIS 50,000 ($14,200) for the attack. If you think that 18 years and a paltry fine is not enough for this attempted murder, you are not alone. But it is not only the sentence that is infuriating the Shapiras and their supporters. It is the confused response of the Israeli government, that can’t decide whether this attack is a criminal offense or an act of war (which is what terrorism essentially is) which is angering not only them, but all victims of terrorism and their supporters, and probably most Israelis. Below is an open letter written by Ruth Shapira explaining her thoughts and reactions, (you can read the original letter in Hebrew here) which I translated myself with her permission. Please share and distribute as much as possible. So why did not I go to court? Today, the trial ended of one of the two terrorists who threw firebomb that turned our lives upside down. The defendant admitted to the court two incidents of throwing Molotov cocktails – the first lightly damaged our family car, and the second almost killed Ayala, my eldest daughter. We often hear from families of victims of crime who came to court to “look the defendant in the eye.” We chose not to come. The reason for this, we feel, is that the state has not really decided whether this is a specific criminal incident or an event on a national level. On the one hand, the state recognizes us as victims of hostile acts, finances for us for the (very expensive) medical care and all the accompanying expenses, and supports and accompanies us in the long process of rehabilitation. The media interest in the story also seems to reflect public opinion and the ready spirit that is beating in the heart of the people. Thus, in effect, the state recognizes Ayala as having been harmed by an act directed against the state, similar to a soldier who was injured during his army service. (Or in the language of the law: harm from hostile acts by military or semi-military or irregular forces of a state hostile to Israel, from hostile acts by an organization hostile to Israel or hostile acts carried out while assisting one of them, as their emissary or on their behalf or in order to advance their objectives – The Law of Compensation for Victims of Hostilities, 5730-1970). On the other hand, the same state treats the terrorist himself as a criminal transgressor and not as an enemy soldier and accordingly puts him on trial for “three attempts of murder” (mine, Avner’s, and our daughter Ayala’s) and not (if already) on assisting the enemy. He would certainly agree to the language of the law. After all he does not know Ayala personally (in fact, I have difficulty remembering his name) and has nothing personal against her. Did he know, at the time of the act, that she was the one in the car? Definately not. Did he commit “three attempted murders”? He made two attempts to murder as many Jews as possible, with the clear intention of harming the sovereignty of the State of Israel. But he did not look like a soldier! One of them is even a minor! Well, that’s exactly what “irregular forces of a hostile organization” look like. 1. The test of intention: Was the intention to harm the sovereignty of the State of Israel or a specific person? 2. The test of the environment: Was the arrest carried out as an ordinary police action, or was it more like a military operation? If there was a need for large forces to stop the terrorist, and there was a fear that someone might try to harm these forces during arrest, well, this is not a regular criminal, but an irregular combatant of a hostile organization (the hostile organization in this case, forms the hostile environment in which he lives). And me? As a mother, of course I would like to see the terrorist punished. I would like him to suffer as Ayala suffers. That his mother will go mad with worry as he hovers between life and death. That he will writhe in pain even while he is asleep, and the percentage of painkillers in his blood will exceed all imagination. That he will undergo surgery, after surgery after surgery, without knowing when it will be over. Since there is no clause in Israeli law that matches such a sentence, I would have been content with the death sentence or life imprisonment. But aside from being Ayala’s mother, I am also an Israeli citizen, and I care about the country’s future as well, so I can not come to terms with his being tried on a clause so far from the act he committed. It is important for me to clarify that I have no complaints against the military prosecution, which does its work faithfully. The problem is with the government, which prefers to escape responsibility for managing the war, and to transfer it to the legal system. Who is the main victim of this policy? Well, the answer is easy. The State of Israel is losing a great deal of money, both on the rehabilitation of victims of hostile acts and on the holding of terrorists in prisons, it is losing the international public relations arena, and slowly losing its sovereignty. So I should look at the terrorist in the eyes? It is more important and urgent for policymakers to look into the eyes of the people. The Border Police officer killed in a coordinated stabbing and shooting attack in two areas in Jerusalem’s Old City on Friday evening was identified late Friday as Hadas Malka, 23. The three attackers, all of whom were members of Palestinian terrorist groups, were shot dead in the course of the attacks. Malka was critically injured in a stabbing attack on Sultan Suleiman Street near Damascus Gate on Friday evening. She was transferred to Hadassah Hospital Mount Scopus in Jerusalem where she underwent emergency surgery but later succumbed to her injuries. She fought her attacker for several seconds while attempting to draw her weapon, according to a Border Police statement. Nearby troops shot and killed the assailant. According to the Border Police statement, Malka was part of a group of officers responding to sounds of gunfire near their area of patrol close to Damascus Gate, when she was attacked. The gunfire was coming from an attack seconds earlier in which two assailants attacked Border Police troops with a homemade Carl Gustav sub-machine gun and knives, at Zedakiah’s Cave in the Muslim Quarter. Some reports said the gun used by the attackers jammed, preventing further casualties. The two attackers were killed. While on her way to the scene, Malka was accosted by a third attacker. “Hadas fought her attacker for several seconds, while he stabbed her repeatedly and while trying to reach for her weapon,” the statement read. Nearby troops opened fire and killed the attacker. At least four more people were injured in the attacks, including another cop. They all sustained light to moderate wounds and were being treated in hospital. Participating in her funeral were family, friends, Public Security Minister Gilad Erdan (Likud), opposition leader Yitzhak Herzog (Zionist Union), Police Commissioner Roni Alsheikh, Border Police Commander Major General Yaakov Shabtai, Human Resources Department Head Major General Gila Gaziel, Ashdod Mayor Yehiel Lasri, and various MKs, regional council heads, police commanders, ministers, and Jews of all stripes and factions. “We will continue to walk in Hadas’ path. We will not surrender and we will not bow our heads before these accursed terrorists. We will pursue our enemies and those who seek our downfall. “I learned that you were a different species of fighter. You fought out of a feeling of mission, out of a desire to contribute. You insisted on transferring to the Border Police and becoming one of us. As soon as you finished your mandatory service, you signed on for five years of voluntary service. You wanted to take an officers’ course, and you remained faithful to yourself and to the values you learned at home. Your friends say you were an entire world. You were moral, you loved Israel and its people. “Hadas’ commanders say she was an excellent fighter, who aspired to excellence, and who dotted every i and crossed every t. On Friday night, three evil terrorists came to kill, to kill Jews. “Hadas and her partners worked bravely to neutralize the terrorists, who were armed with a rifle and knives. Unfortunately, Hadas paid with her life. Hadas Malka, 23, the Border Police officer stabbed to death by a Palestinian assailant in a terror attack outside Jerusalem’s Old City on Friday evening, had sent a final selfie to her friends just minutes before the attack, wishing “Shabbat Shalom to my loving friends.” Those friends on Saturday remembered her as loving and fearless — a “real-life Wonder Woman,” said one. The friends spoke of how Malka had been in the navy, but wanted to be a combat soldier and transferred to the Border Police where she did the rest of her mandatory military service and then extended it 15 months ago and became an officer. 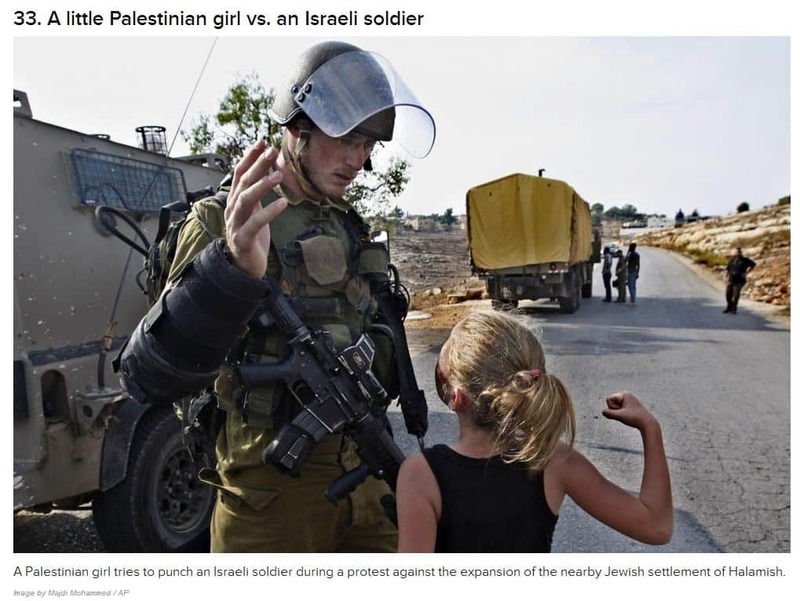 They also recounted how she was never afraid, despite all the attacks that have occurred in and near the Old City in Jerusalem, where she was on duty. “No one will come approach me … They won’t dare even come close to me,” she would tell them, according to Ynet. What a terrible loss to her family, her friends and the people of Israel. May the memory of Hadas Malka Hy’d be for a blessing and may her family be comforted amongst the mourners of Zion and Jerusalem. The Shin Bet security service named the three assailants as Adel Ankush, 18, Bra’a Salah, 19, and Asama Ahmed Atta, 19, all from the West Bank village of Deir Abu-Mash’al near Ramallah. All three had been arrested for or involved in “popular terror activity,” a Shin Bet statement read. The attack was carried out by “two Palestinians from the Popular Front for the Liberation of Palestine and a third from Hamas,” Hamas said early Saturday, dismissing a claim of responsibility by Islamic State. Israeli officials cast doubt on both claims, saying there was no indication of IS involvement, and that the attack did not appear to have been directed by any group. The ISIS claim, if true, would make it the first ISIS attack on Israel. So here we have IS, Hamas and PFLP claiming the murderers belonged to them, while the father of one of them claims otherwise. Clearly, at least one of the terror organizations is lying, yet they do so because it enhances their reputation. Imagine that – boasting of killing a woman as being good for business. Sick does not begin to describe it. Yet we are somehow supposed to sit down and negotiate peace with such people? Nope, not anger and frustration over the so-called “occupation.” This is about Islamic plans to re-establish a Caliphate. Palestinians say it stems from anger over decades of Israeli rule in territories they claim for their future state. “Need a new term for this nonsense. Sort of the opposite of victim blaming. How about Culprit Coddling? Maybe Criminal Cozying? Thoughts?? ?,” he tweeted. Prime Minister Benjamin Netanyahu ordered the Ministry of Foreign Affairs to reproach the BBC after the British news channel released what the premier deemed to be a biased report describing Friday’s terror attack, which resulted in the death of a 23-year-old border policewoman. According to the MFA, prompted by the ministry’s request, the BBC has since changed the headline of the article. The tweet that the media outlet published on its official handle and which linked to the article with its previous headline has since been removed. This is not the first time Israel lashes out at the BBC for what it says is a biased coverage of the conflict. 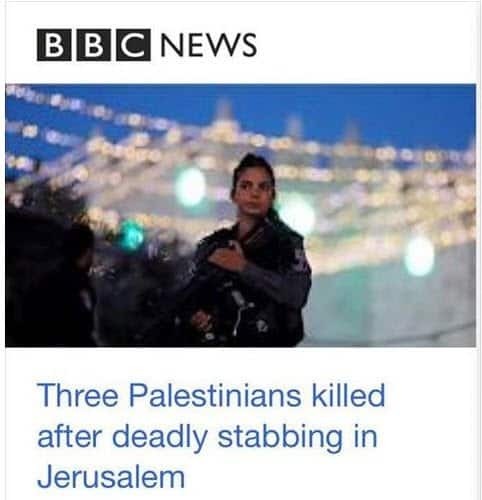 You can read about that spat here – but nothing changes, the BBC, AP and most of the rest of the international media continue with their anti-Israel bias, blaming the victim (Israel) and exonerating the perpetrators, while slanting their headlines and reports to cast Israel into the worst possible light. It is a fight that never ends, almost like our fight against the terrorists.